I can't wait for this workshop, I'm really excited to be taught by such an amazing artist of world renown. I can't wait to see what I come home with on the Sunday! 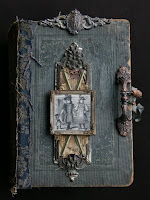 OMG -- I absolutely love this altered book...this is an inspiration to me..thanks for sharing. WHOA! This stuff is out of this world!!!! Why don't I live in Australia?? ?